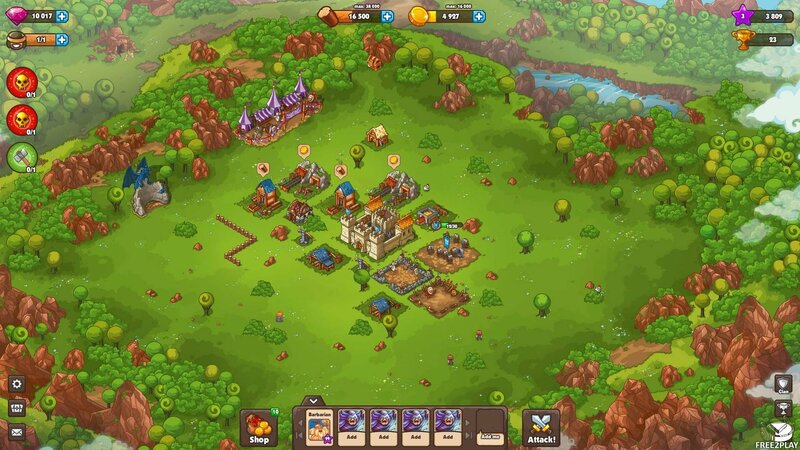 The game is a strategic title where players will have to compete with each other to establish their villages, collect resources and build defenses to protect themselves from the attacks of their rivals. Simultaneously, players will need to train a barbarian horde to attack, destroy and plunder its enemies, whether they are controlled by the AI or by other players, to get resources and rewards. The game has two primary focuses: Defend your base and destroy your enemies. 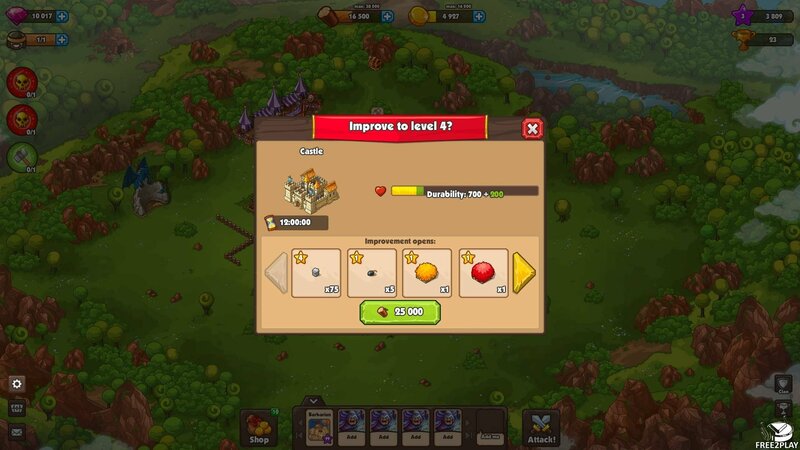 For the former players will need to collect resources, namely gold and wood, these are the basis of practically every building, unit and action used in the game and can be acquired through resource production building (Saw Mill and Mine), as rewards for completing Quests or from attacking enemy players and AI rivals. 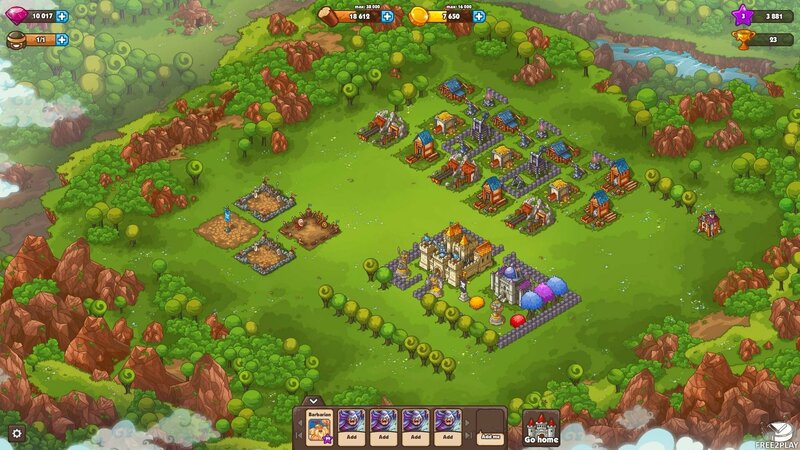 On the other hand players must raise an army of barbarians, from Knights, Thieves, Archers and more and send them off to attack enemy bases, fight past their defenses and try to destroy buildings to gain as many resources as possible before your troops are killed, all the structures are destroyed, or the time limit is up. Similarly players will be able to attack your base and do the same, so having good defenses is vital to survival. There are three primary currencies in the game: Wood, Gold and Crystals. Wood and Gold are standard currency with Wood acquired from the Wood Saw and Gold acquired from the Mine, both being buildings that players can construct in their base. When these resources are harvested players must actively click the respective buildings to move the resources into their storage. Resources are spent to build new structures in your town, upgrade them, create defenses such as walls, catapults and crossbows and even train up your own army of barbarian soldiers. 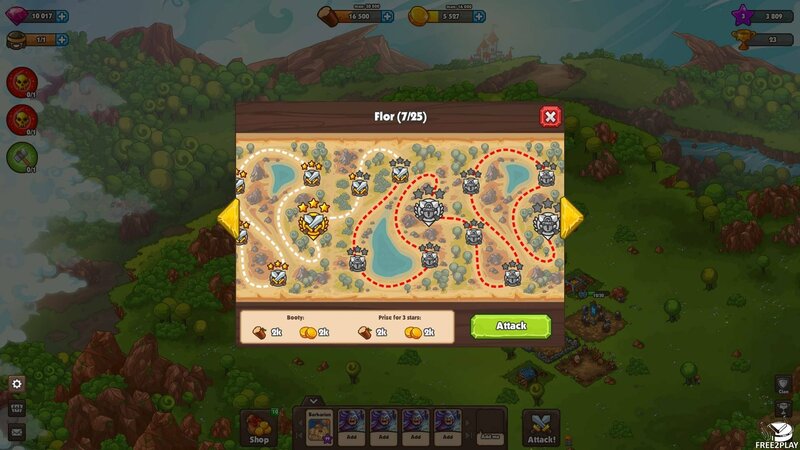 Resources can also be gained either through completing Quests given by the game, such as telling you to construct a particular building or train certain units, as well as attacking enemies and raiding their bases. When a player is ready to fight an enemy, either a randomly selected player or taking on the AI campaign, they get ten seconds to scout the enemy town looking for the best place to start placing their units for the attack. When the timer ends players only have a few minutes to attack the town, this is done by clicking around the perimeter of the town (players can't drop troops in the middle of the town) to individually place units from which the units will follow their own prioritized actions and attack the various buildings or defenses. Players have no control over their units once they are placed and the battle becomes automated and ends with the destruction of all the buildings, the attacking force or if the timer runs out.